Today, a new small tool, which I publish as freeware. Many photos (eg. from mobile phones) nowadays contain the coordinates of the place where the picture was taken. Now where was that again? How can I look at it? With jpg2map it’s really simple. 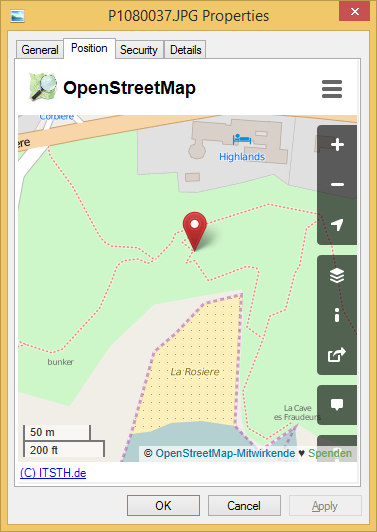 In the properties of the file you will find a map of the place. As usual zoom- and scrollable (Thanks to OpenStreetMap). This entry was posted on Monday, June 22nd, 2015 at 9:42 am	and is filed under Free, New Release. You can follow any responses to this entry through the RSS 2.0 feed. Both comments and pings are currently closed.